Have You Seen The Evenflo Pivot? Okay, so I know you’ve seen the pivot because it was one of my top choices from this year’s Baby Show. But have you seen it in person??? If not, please do. Go check it out at a store or stop a stranger on the street to get a good look. Talk about quality!!! I cannot tell you how many people I’ve floored by telling them the retail price. On first glance I’ve had a few friends mistaken the Pivot for a carriage that costs about FIVE times the retail price. In case you’re wondering it goes for close to $300. We received this product for review purposes. As always the views expressed here are honest and solely those of mine and JustaBXgilr. Yes, I love the stroller but more importantly JustaBXgirl loves it. She has named it. We were both heartbroken for the fifteen minutes we thought V (that’s short for the name JustaBXgirl named the Pivot) was lost. Yup, this mama did not remember where I parked at Disneyland and was positive that someone stole my carriage! Hey, it’s not completely my fault. We had been evacuated from a building due to a power outage and they had moved the carriages which made me think I parked somewhere else. Thank goodness for Disneyland Security Officer Curt we were reunited with V! On a day to day basis I do prefer a smaller, more umbrella type stroller since JustaBXgirl doesn’t really use a carriage much anymore but when it comes to being outside all day, traveling, or attending any type of outdoor event I need a full size carriage and this one delivers! V has now accompanied us to Splish Splash, a wedding in Oxnard, CA, Disneyland and a host of other places around NYC. Barbie and Flambow both agree that the Pivot is a comfortable ride! My favorite thing about this carriage is that both JustaBXgirl and my baby nephew can use it and be comfortable and safe!!! Yup, a 4 1/2 year old can use the same carriage as a 2 1/2 month old!!! Don’t believe me? Check out the photos. Baby T slept like the prince he is when he visited us and took over the Pivot as his bassinet. This puts me at ease as it means when we go places with him there’s no need to fret. He can be safe and snug in the bassinet and JustaBXgirl can walk OR the Pivot can transform into a stroller for JustaBXgirl and Baby T can be worn in a carrier. And when he gets older I can switch the big kid seat to face me while driving him around until he, like his big cousin insists on facing the world. A close second in why I love this carriage would be the space! It doesn’t seem that big but it can store so much! Again the proof is in the pictures. I have no idea how I would have handled our California tip if I didn’t have it with me. This thing managed to hold ALL of our bags easily and was still pretty simple to push. I did occasionally have trouble making turns but that probably had more to do with my lack of driving skills than any fault of the carriage. It was also pretty easy to push one handed which is not the case with some of the other carriages we have. JustaBXgirl says V is very comfy and her favorite part is the canopy. It is a great canopy. It can block the sun or rain. JustaBXgirl is a bit on the short side (she gets it from he mama) so this carriage fits her well. If she was a few inches taller I’m not sure how comfortable it would be as her legs would hang over the footrest but would still be high enough not to drag on the floor. 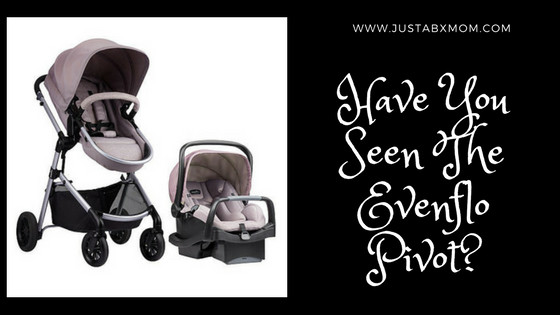 The Pivot is a travel system. It comes with the SafeMax Infant Car Seat with Anti-rebound bar. We haven’t had the opportunity to use it yet but are keeping it handy for if Baby T joins us for a car ride anywhere. I love the rebound bar which helps reduce the movement of the seat in a frontal impact. If this travel system was around when JustaBXgirl was an infant I probably wouldn’t have needed anything else! I am def gonna check it out. My critters are all growing bigger and bigger everyday and they all like to take a break when we are out all day so this just might be the new stroller for us. We were all about the City Mini heartbroken when it finally broke after close to 7 year of abuse, lol but V def looks like she would be worth the price. Multi use, the canopy and the handle bar (easy for one handed pushing) are all point I LOVE. My youngest just turned a year but I just recommended this for my sister who is looking to expand her family and still has a 2 year old that can use it in the mean time . Love all the variety! !